In an industry where you are entrusted with the responsibility of safe-keeping. the Lion BD 90 Bankers Door will reinforce your confidence. Built with a high degree of protection against attack from a wide range of sophisticated tools, the Lion BD 90 Bankers Door offers a strong and solid line of resistance. 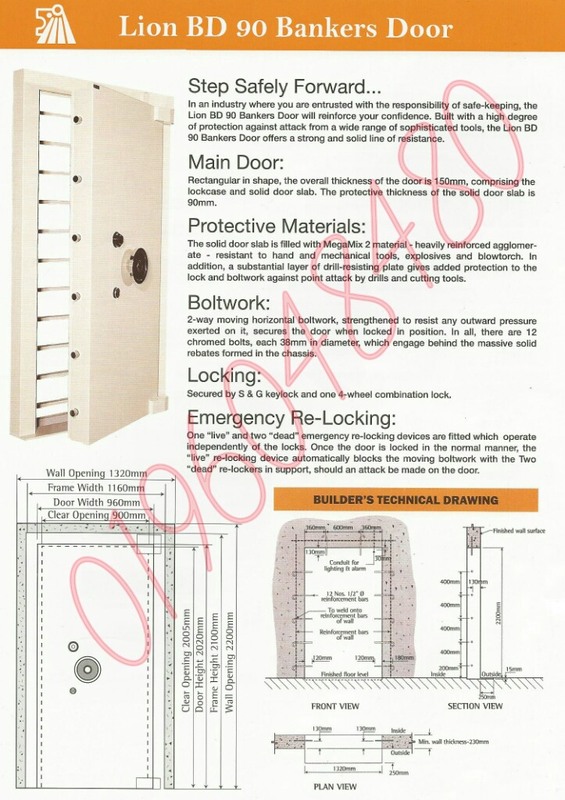 Main Door - Rectangular in shape, the overall thickness of the door is 150mm, comprising the lockcase and solid door slab. The protective thickness of the solid door slab is 90mm. Protective Materials - The solid door slad is filled with MegaMix 2 - heavily reinforced agglomerate - resistant to hand and mechanical tools, explosives and blowtorch. In addition, a substantial layer of drill-resisting plate gives added protection to the lock and boltwork against point attack by drills and cutting tools. Boltwork - 2-way moving horizontal boltwork, strengthened to resist any outward pressure exerted on it, secures the door when locked in position. In all, there are 12 chromed bolts, each 38mm in diameter, which engage behind the massive solid rebates formed in the chassis. Locking - Secured by S&G Keylock and one 4-wheel combination lock. Emergency Re-Locking - One "live" and two "dead" emergency re-locking devices are fitted which operate independently of the lock. Once the door is locked in the normal manner, the "live" re-locking device automatically blocks the moving boltwork with the two "dead" re-lockers in support, should an attacks be made on the door. Chasis - The door is mounted onto the solid chasis by heavy-duty hinges allowing for vertical adjustment. The chassis is fixed to the prepared wall opening by bots, which after grouting, ensure that the door becomes an integral part of the vault. This is done deliberately in order to frustrate an attmpt at "blowing" the door outward by means of explosives. Lighting Control - A 15 amps switch is supplied which automatically controls the lighting within the vault. Alarm Sensors - As an option, extra alarm sensors can be fitted to the boltwork, which would link into the burglar system protecting the premises. Any attempt at opening the door would indicate an alarm condition. Finish - Lion BD 90 Bankers Door is available in painted finish with option of grille gate. In today's era of information, record keeping is of the utmost importance. Detailed information of transaction, dealings and other vital business information needs to be stored safely and securely. Step into a new realm of safekeeping with the Lion SD 50 Security Door. Manufactured by Lion to be fire resistant and burglary resistant. 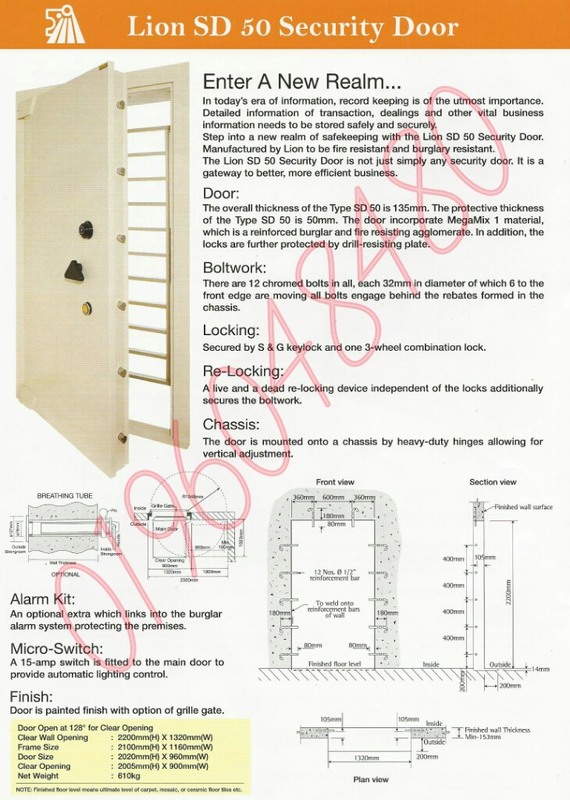 The Lion SD 50 Security Door is not just simply any security door. It is a gateway to better, more efficient business. Door - The overall thickness of the type SD 50 is 135mm.The proctective thickness of the type SD 50 is 50mm. 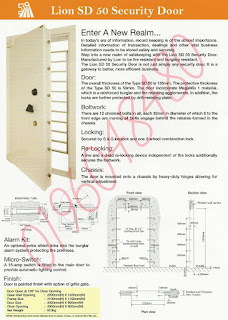 The door incorporate MegaMix 1 material, which is a reinforced burglar and fire resisting aggomerate. In addition, thelocks are further protected by drill-resisting plate. Boltwork - There are 12 chromed bolts in all, each 32mm in diameter of which 6 to the front edge are moving all bolts engage behind the rebates formed in the chassis. 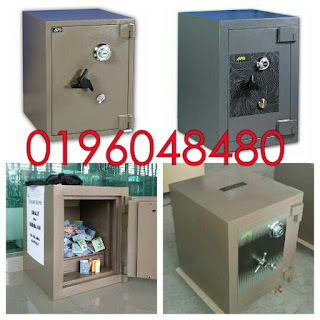 Locking - Secured by S&G Keylock and one 3-wheel combination lock. 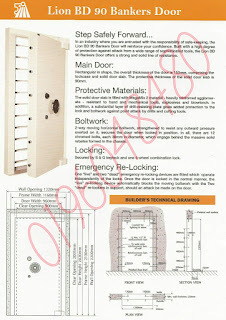 Re-Locking - A live and a dead re-locking device independent of the locks additionally secures the boltwork. Chassis - The door is mounted onto a chassis by heavy-duty hinges allowing for vertical adjustment. Alarm Kit - An optional extra which would link into the burglar system protecting the premises. Micro-Switch - A 15-amp switch is fitted to the main door to provide automatic lighting control.